Riley is one wild child when she sleeps! Since she started jumping out of her crib and scaring me half to death, we began the transition from toddler bed to big girl's bed. We've moved her toddler mattress directly to the floor so that she can't hurt herself, for she constantly rolls and flops around all over the place while she sleeps. I would really like her to start sleeping in her twin-sized bed, but am very afraid that she will fall out of it. Thankfully, Summer Infant has developed a great item to keep your wildest sleeper safe during the night...the Sure&Secure Double Bedrail! Keep reading to learn more about it! 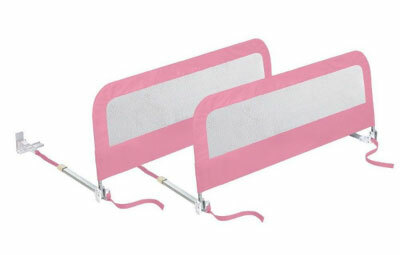 I reviewed the Sure&Secure Double Bedrail in Pink from Summer Infant, which retails for $39.95, but is currently on sale for $35.00 with FREE SHIPPING. The Sure&Secure Double Bedrail from Summer Infant allows your child to feel safe and sleep peacefully, even if their bed is located in the middle of the room. Each panel measures 42.5 inches long to provide plenty of protection from accidental falls off the bed during the night. I was thrilled when I opened the box and saw that there were very few parts included. I hate long and tedious product assemblies and that was definitely not the case with the Sure&Secure Double Bedrail. Basically, here is how it is done: Snap the pieces together to create the bedrails themselves and then insert each side of the bedrail onto a plastic hinge. Repeat this process for the other bedrail. Next, connect the two rails through the two adjustable straps. These straps make it so that the Sure&Secure Double Bedrail will fit either a twin size or queen size bed. Finally, just take off the mattress and position the straps onto the box spring itself. Replace the mattress and your child can now sleep safe and soundly...and so can you! The Sure&Secure Double Bedrail also folds down easily, which is great for when you need to change the bedding. In the pictures above, you can see how the quilt is pulled underneath the bedrail to really tuck the child in. Because I have the Sure&Secure Double Bedrail on Riley's bed very snugly, I find it easier to just fold her quilt up on the sides, rather than try and pull it underneath. The only criticism that I have of the Sure&Secure Double Bedrail is that some of the most important parts comprising it are made of plastic, which could possibly break. I wish that the hinges and the buckles on the adjustable straps would have been made from metal, rather than plastic. Summer Infant does back this product with a full one-year manufacturer's warranty though, so if anything does break, they will replace it. If you have a rough tumbler that you want to protect from an accidental fall at night, then I highly recommend the Summer Infant Sure&Secure Double Bedrail. 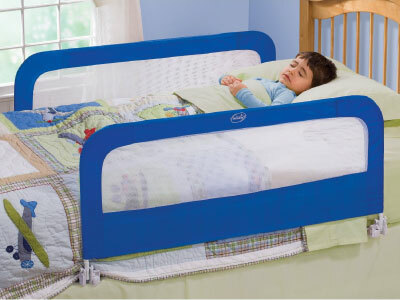 With 42.5" of protection on either side of their bed, your little one can roll around to their heart's delight...safely! Now I can definitely sleep a little more soundly too! Disclosure: I received the Sure&Secure Double Bedrail in Pink from Summer Infant in order to facilitate my review. No other compensation was received. This product review is based on my own personal experiences with this item and is completely honest and objective.